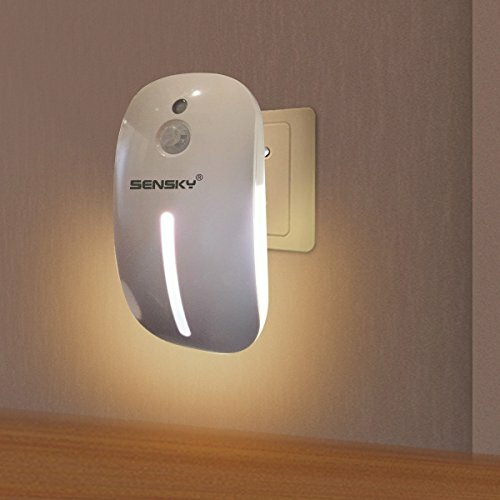 Why you need a Sensky SKL001 motion sensor light? Reason 1?Easy to use : Plug in AC outlet directly. Reason 2, Two modes: Both brightness and smarter PIR motion sensor light. Auto: Front LED on at dark, When a human body enters into reaction field at dark, the back LED on. On: Manual light front LED on. Reason 4, Elegant Design: It will enhance your life and Decorate your home. Reason 5, Application is broad: You can use this plug in motion sensor night light in Bedroom, Laundry Room, Hallway, Basement, Stairwells, Kitchen, Nursery Etc. Reason 6, High quality : Made up in electronic parts and components CE Approved and 1 Year Warranty. Reason 7, Green packaging, Focus on quality, Refused to fancy, avoid unnecessary wastes.